The last post looked at the nativity of soldiers in the 23rd Illinois Infantry, based on analysis of records pertaining to 1,585 of its men. The place of birth for 1,270 had been noted; of these 682 were from Ireland. Where were these Irishmen from? 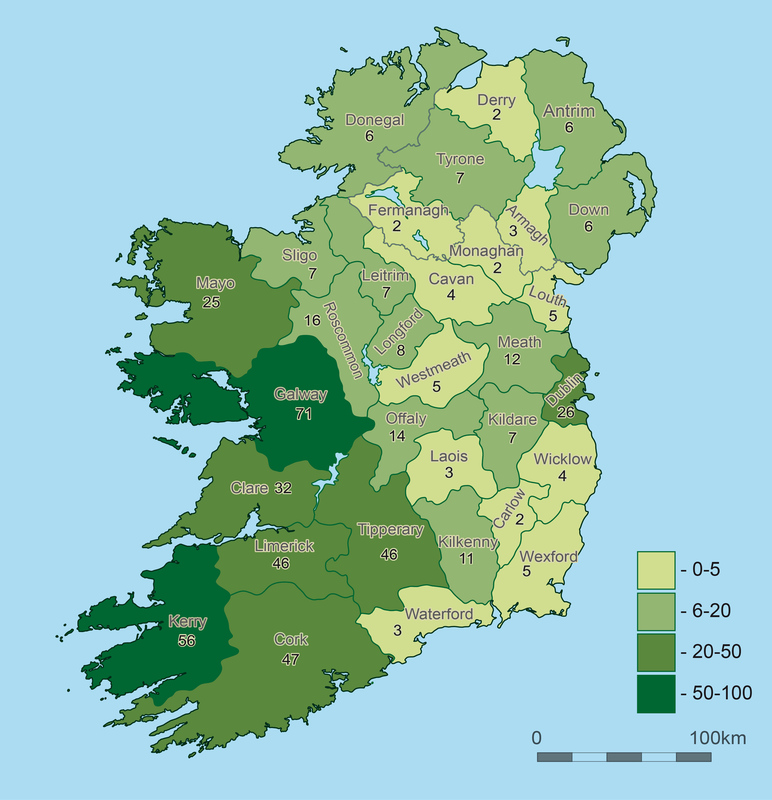 How many Irish counties were represented? Were any concentrations discernible? In this second in the series on the 23rd Illinois, we explore the origins of the men who eventually found themselves on the other side of the Atlantic, marching and fighting through iconic locations such as the Shenandoah Valley and Petersburg. The ten companies of the 23rd Illinois were organised at different locations, as set out in the table below. Some of the companies, such as the Shields Guards, had their origins in Irish dominated pre- war militia formations. It is apparent that there were Irish-born soldiers present throughout the regiment; unfortunately due to a lack of nativity data for some of the companies, such as Company D, it is not possible to state with certainty the total number within each unit. What is clear is that there were substantial numbers of Irish-born in companies such as B, K and F, and most likely numbers were high across much of the regiment. But where in Ireland were these men from? Of the 682 men recorded as having been born in Ireland, additional information on the town or county of birth was available for 496 of them. Interestingly, there was at least one man from each of the 32 counties on the island of Ireland in the ranks of the 23rd Illinois. The number per county and concentrations can be seen in the map below. While every county is represented, what is immediately noticeable is a concentration of men from the west and south-west of the country. Although these regions did suffer badly during the Famine of the 1840s, leading to increased emigration, this alone is not sufficient to explain the distribution pattern we see within the ranks of the 23rd. 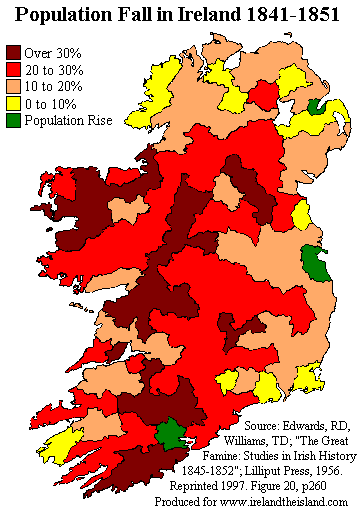 As can be seen from the graphic highlighting population reduction in Ireland between 1841 and 1851, many other areas were also devastated by the Famine, but some of these have relatively low representation in the 23rd Illinois. It is interesting to consider if there were any community aspects at play; emigrants from the same locale often found themselves sharing the same community in the United States, and it seems probable that small groups of men from the same place in Ireland may have then joined up to fight together. There is some evidence of this when we look for concentrations of men within the 23rd Illinois company structure. Most notable are Company F, which had at least 37 men born in Kerry amongst its number, while Company B had a minimum of 23 Tipperary men in the ranks. The strong Irish-born presence in the 23rd Illinois was one of the elements that gave the unit its Irish character. However, analysis of the nativity data for these men suggests that they were not only Irish but were often from the same regions of Ireland; as a result large numbers of men from places like Galway, Kerry, Limerick, Tipperary and Cork served together in the 23rd Illinois. In many instances they not only shared a country of birth, but were often intimately familiar with the same localities as their comrades. No doubt many a campfire in Missouri and Virginia between 1861 and 1865 witnessed friendly chat and shared reminiscences about hearth and home in the farms, villages and towns of west and south-west Ireland. *Special thanks to Sara Nylund for preparing the Ireland illustration for this post. Several sociall scientists have traced theorigin of Iriskmen in Philadelphia and have found the majority came fro the North of Ireland–both Ulstermen and Irishmen. Th 1860 census listed about 100,000 citizens of Philadelphia born in Ireland. I think there were only about 25,000 from Chicago who were born in Ireland.NYC led the pack with about 1,000,000. Nicely done, Damian. Thank for posting. Many thanks Vincent, Glad you enjoyed it! Some American’s motivation can never be traced by social science means. My pet puzzler is Private Frederick Funk, Company C, 69th Pennsylvania Veteran Volunteers. Funk is the son of John and Rachel Funk married by a presbyterian minister, Rev. Gutelius, at York county, Pennsylvania 10 January 1833. We find Fred enlisting 1 May 1861 in C Company, (Emmett Guards), 24th Pa. Vols. for 90 days. The company is commanded by Captain James O’Reilly, born in County Cavan, and a member of the Fenian Brotherhood of America. Now York county, along with Lancaster county is the absolute center of Pennsylvania Dutch country. Before enlisting Fred is a 25 year old plumber living in Philadelphia. On August 29th, 1861 Fred reenlisted in C Company, 69th Pennsylvania, still commanded by O’Reilly. Fred is wounded 30 June 1862 at the battle of Glendale, Virginia. Returning to duty Funk is with his company at Antietam, Fredericksburg, and Gettysburg. In the autumn of 1863 he is detatched for Pioneer duty with the brigade. On 1 February 1864 Funk reenlists as a Veteran Volunteer for three more years. On 1 July 1865 Funk musters out with the 69th at Munson Hill, Virginia…….So where is his connection to the Irish regiment and his company commander who is not only an Irishman but a Fenian? I’ve always wondered about Funk..???? Fascinating analysis. It would be interesting to see the Irish localities in which these men were born if that information is available, or perhaps you will come up with a great explanation as to why so many from Tipperary, Cork, Kerry, Galway and Clare ended up in Illinois. Were they recruited perhaps? In most instances it only provides county information- in a very few a town is mentioned, e.g. Boyle or Bandon. It would be interesting to know the reasons for the geographical concentration, and if any pictures emerge when looking at other ethnic Irish regiments. Hi Damian. Hope you had great christmas and happy new year. Brillant post! Likewise and many thanks! Welcome to wordpress by the way I love the new look of your blog! Thanks for the great graphics. As a collector of the 23rd, it makes for an interesting visual to see how many of the men came from Ireland. The maps show the impact so clearly, it is interesting that the places the known soliders were from were not necessarily those with the highest emigration. It makes you wonder where they all went. 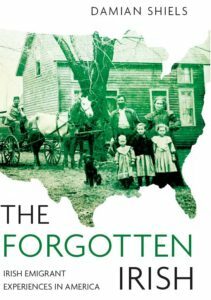 Absolutely Sharon- I think the degree of localism among emigrants in the U.S. is fascinating and is something I consistently come across in the files. People tended to live with others from their area in Ireland, and I think we would find this in a lot of Civil War units if we could extract the information.